Here you can find a strain description about Timewarp 5 reg Next Generation and also some user-based reviews and infos directly from the SeedFinder (if available). You can also find the offers and auctions here if Timewarp 5 reg Next Generation cannabis seeds are on stock at MyCannapot right now. This is our version of the famous `Texada Timewarp`. It is an F5 backcross with the original Timewarp Clone mother. Beautiful lemony fresh smelling buds with an up high. 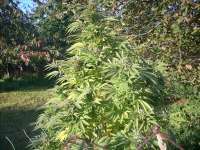 Great producing strain outdoors, very dependable. Texada Timewarp has been grown on Texada and Vancouver Island for over 30 years, and for good reason. A must have strain for the outdoor farmer. Texada Timewarp is of Vancouver Islands most plentiful and common outdoor strains, and with good reason. Its big lemony buds are a legend out here and have been considered the taste of British Columbias Gulf Islands for around 30 years now. The Original Texada Timewarp is a clone only and has been kept going for many decades. Many BC breeders have made crosses of it to add to there collection. The serious outdoor farmers in BC keep coming back to this old favorite for it hardy growth, big yields, and great high. Very consistent early strain that can take a little bad weather if it has to. Next Generation Seed Company is one of the companies that have had a lot of experience with this strain. For 5 years they have been selectively backcrossing into the original Timewarp to produce a stabilized version. The male used now is a 5 time backcross and the offspring from these are very close to the original clone. About 90% of the seedlings have that same strong smell and large buds. Most plants will also turn purple in the last few weeks. Big yields can be expected from this one. Average yield for novice growers is between 2 ounces to 6 ounces per plant on an average year. This is also about what to expect per plant from a remote guerrilla patch that doesnt get a lot of care and attention. Experienced growers can get between 5 ounces to 10 ounces, and on a good year can reach a pound per plant with proper care and expert attention. These weights are for growers around the 49th parallel(around the Canadian/US border). And of course the farther south you grow the bigger and better the yields you can expect. dzhangar09 Zweiter später Timewarp Phänotyp grün ist sehr harzig!! Timewarp 5 reg Next Generation is not available at our shop at the moment!